Keeping kids entertained over the school holidays isn't always easy. Fairies understand this so they like to help by visiting often and leaving activities for your children to complete during the day. All your child needs to receive fairy visits is a special place in their bedroom or outdoors with perhaps a basket, table or shelf for the fairies to leave their 'gifts' overnight. If the fairies haven't visited your home before, they usually start with an introduction letter with details about themselves and questions for their human. Fairy mail is the most common way your fairy will communicate with your child. The fairies know that letter writing is a great way to encourage reading and writing skills so they love receiving mail just as much as sending it. The fairies that visit our home type letters on our computer and print them out as their writing is very small and difficult for our human eyes to read. Some fairies do perfer hand written letters though so your child may receive miniature sized paper with cursive script, or sometimes, if they are using human pencils, their writing is large but messy - even with the help of pixie dust, those pencils can be hard for little fairies to control. Fairies like to feel invited into a humans home and once the introductions are complete they will like to have a space that they feel was created just for them. To prompt this, your fairy may leave miniature furniture or accessories and may supply a new piece every few days over the two weeks. As a rule, fairies are more comfortable outside amonst the plants and flowers, but they are enchanted by human children so will happily visit them indoors if they have a safe place to enjoy. The fairies can leave out the recipes or ingredients for fairy playdough, magic mud, moon sand or slime. These examples are all non-toxic and made from common household ingredients. The fairies can gather together all the 'bits' for creating crafts. For a fairy wand they may leave things like a felt or cardboard star, dowel or twigs, glue, beads, diamonties, ribbons and glitter. Other crafts could include a fairy princess crown, fairy wings or even a fire breathing dragon! The fairies often go into our cupboards and get out my daughters pencils, textas or paints. They leave colouring pages and plain paper for her own drawings. They love to receive pictures of flowers, trees or their insect friends. The fairies may simply leave your child's favourite dress ups out for them to play with. Hot towels, home made face masks, cucumber slices over the eyes while listening to music (or a story CD) and a foot soak. Many schools don't allow kids to wear nail polish so paint her (or his) toes for a treat. If your child is reluctant getting haircuts, having it prompted by the fairies may be enough to settle their nerves. A basket of pamper goodies left by the fairies can be a nice and relaxing treat for parent and child to enjoy together. The fairies could supply ready made bubbles or leave a recipe and ingredients for your child to make their own. They may also leave pipe cleaners (or wire and decorative beads) to create their own bubble wands. Fairies are very social so may request your child be the party planner for their next party - maybe a suprise party for a fairy or animal friend. The fairies will write a list of their requests including theme, decorations and food. They may choose a quaint little tea party or to dance the night away under the stars! We hosted a party last Spring and it was a big hit for the fairies, snails and Miss C. You can read about it here. Seeds and seedlings are a favourite gift for fairies to leave a child. They love seeing kids getting into the garden, caring for plants and learning about the natural world around them. We often receive edible herbs or veggies from our fairies. Not only do they look and smell great but kids get enjoyment out of cooking with the produce they have grown themselves, ultimately promoting healthy eating and a healthy lifestyle. Whether it's a packet mix or from scratch, it doesn't really matter. Fairies love fairy cakes, herb muffins (using herbs fresh from the garden) or berry pikelets and will leave a selection of ingredients and a recipe for your child. They may suggest a recipe that uses produce from your garden, perhaps from a plant they gifted on a previous visit, or they may simply leave an egg or a selection of fruit for breakfast. If you have more than one child, getting them to play nicely together can sometimes be a challenge, especially towards the end of the holidays. The fairies like to encourage siblings to play together by leaving out board games, a deck of cards or sporting equipment. Occasionally the 'Tinker Fairies' need 'lost things' for their newest invention and they are unable to source them in Pixie Hollow. They'll leave a list of items for your child to find for them. It may include things like a marble, a skipping rope or a (toy) screwdriver, which can be returned to your child at a later visit. The 'Garden Fairies' also like asking for 'treasures' but they prefer natural items and will leave their lists just for fun, not for construction. They like to ask for items of a certain colour, number, shape or texture. 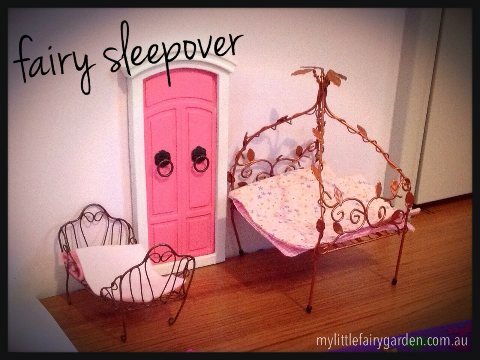 Fairies love sleep-overs just like your children. In our home the fairies have prompted a sleep-over by leaving out their favourite book or favourite movie and popcorn snack. We've never actually seen the fairies but we think they must be listening or watching from their secret hiding place. And when it's time for bed we find a nice place to put their fairy beds and leave out some left over snacks for them to eat in the night. You'll find all the pictured activities and more on our 14 Days of Fairy Visits board over on Pinterest.